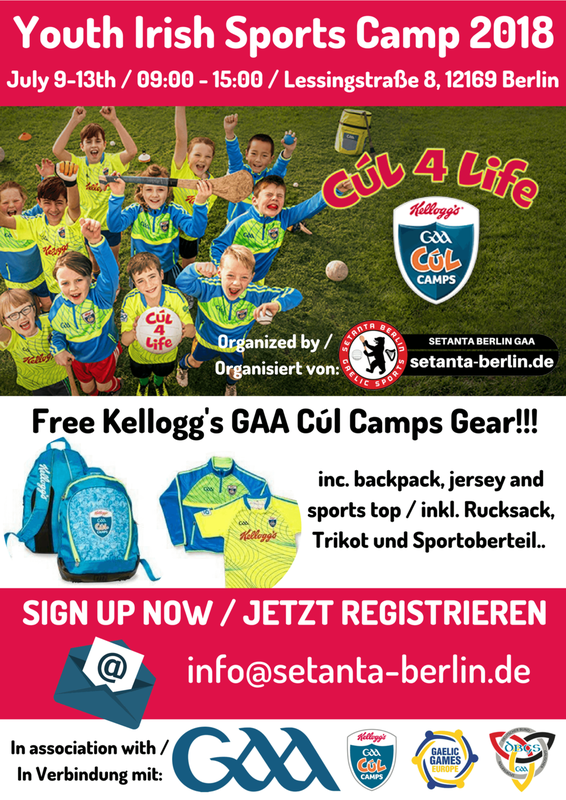 Welcome to Berlin's first official 'Kelloggs GAA Cùl Camp' - a rare opportunity for young Berliners to experience two of Ireland's exciting national sports: Gaelic Football & Hurling. And perhaps more importantly, some quiet time for parents this summer! ➤ Mon 9th - Fri 13th July, 09:00 - 15:00, AN ENTIRE WEEK OF GAA YOUTH TRAINING!!! ➤ Wear comfortable sports clothing and sports shoes appropriate for artifical surface. ➤ Packed lunch and any additional snacks; bring a refillable water bottle. The camps are structured so that a different aspect of the game is worked on each day. The programme involves coaching specific skills of the game and provide the opportunity for children to put into practice what they have learned through small sided games. During the camp week, a "blitz" is organised to provide each child with an introduction to competitive games.